Lynn Apfelbaum - Jewelry by Design - coordinating set of colorful glass beads from Benin, accented with large pieces of coral and Nigerian brass. The necklace (602) is finished with a brass clasp; the bracelet (603B) has a bronze clasp; the earrings (602e) are on g/f wires. 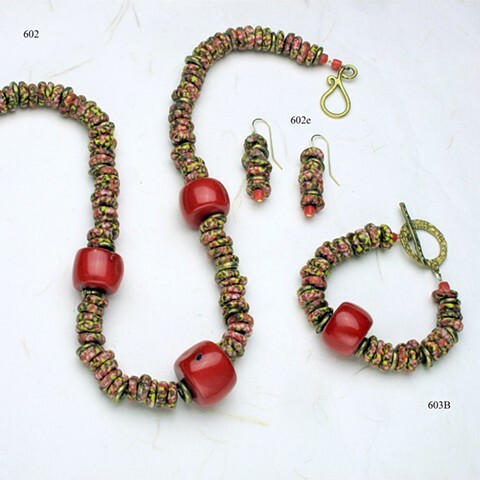 coordinating set of colorful glass beads from Benin, accented with large pieces of coral and Nigerian brass. The necklace (602) is finished with a brass clasp; the bracelet (603B) has a bronze clasp; the earrings (602e) are on g/f wires.